For other uses, see Semele (disambiguation). "Stimula" redirects here. For the genus of grass skipper butterflies, see Stimula (butterfly). Semele (/ˈsɛmɪli/; Greek: Σεμέλη Semelē), in Greek mythology, was the youngest daughter of the Boeotian hero Cadmus and Harmonia, and the mother of Dionysus by Zeus in one of his many origin myths. According to some linguists the name "Semele" is Thraco-Phrygian, derived from a PIE root meaning "earth". Julius Pokorny reconstructs her name from the PIE root *dgem- meaning "earth" and relates it with Thracian Zemele, "mother earth". However, Burkert says that while Semele is "manifestly non-Greek", he also says that "it is no more possible to confirm that Semele is a Thraco-Phrygian word for earth than it is to prove the priority of the Lydian baki- over Bacchus as a name for Dionysos". In one version of the myth, Semele was a priestess of Zeus, and on one occasion was observed by Zeus as she slaughtered a bull at his altar and afterwards swam in the river Asopus to cleanse herself of the blood. Flying over the scene in the guise of an eagle, Zeus fell in love with Semele and repeatedly visited her secretly. Zeus' wife, Hera, a goddess jealous of usurpers, discovered his affair with Semele when she later became pregnant. Appearing as an old crone, Hera befriended Semele, who confided in her that her lover was actually Zeus. Hera pretended not to believe her, and planted seeds of doubt in Semele's mind. Curious, Semele asked Zeus to grant her a boon. Zeus, eager to please his beloved, promised on the River Styx to grant her anything she wanted. She then demanded that Zeus reveal himself in all his glory as proof of his divinity. Though Zeus begged her not to ask this, she persisted and he was forced by his oath to comply. Zeus tried to spare her by showing her the smallest of his bolts and the sparsest thunderstorm clouds he could find. Mortals, however, cannot look upon the gods without incinerating, and she perished, consumed in lightning-ignited flame. Zeus rescued the fetal Dionysus, however, by sewing him into his thigh (whence the epithet Eiraphiotes, "insewn", of the Homeric Hymn). A few months later, Dionysus was born. This leads to his being called "the twice-born". When he grew up, Dionysus rescued his mother from Hades, and she became a goddess on Mount Olympus, with the new name Thyone, presiding over the frenzy inspired by her son Dionysus. There is a story in the Fabulae 167 of Gaius Julius Hyginus, or a later author whose work has been attributed to Hyginus. In this, Dionysus (called Liber) is the son of Jupiter and Proserpina, and was killed by the Titans. Jupiter gave his torn up heart in a drink to Semele, who became pregnant this way. But in another account, Zeus swallows the heart himself, in order to beget his seed on Semele. Hera then convinces Semele to ask Zeus to come to her as a god, and on doing so she dies, and Zeus seals the unborn baby up in his thigh. As a result of this Dionysus "was also called Dimetor [of two mothers]... because the two Dionysoi were born of one father, but of two mothers"
Still another variant of the narrative is found in Callimachus and the 5th century CE Greek writer Nonnus. In this version, the first Dionysus is called Zagreus. Nonnus does not present the conception as virginal; rather, the editor's notes say that Zeus swallowed Zagreus' heart, and visited the mortal woman Semele, whom he seduced and made pregnant. In Dionysiaca 7.110 he classifies Zeus's affair with Semele as one in a set of twelve, the other eleven women on whom he begot children being Io, Europa, Plouto, Danaë, Aigina, Antiope, Leda, Dia, Alcmene, Laodameia, the mother of Sarpedon, and Olympias. The most usual setting for the story of Semele is the palace that occupied the acropolis of Thebes, called the Cadmeia. When Pausanias visited Thebes in the 2nd century CE, he was shown the very bridal chamber where Zeus visited her and begat Dionysus. Since an Oriental inscribed cylindrical seal found at the palace can be dated 14th-13th centuries BCE, the myth of Semele must be Mycenaean or earlier in origin. At the Alcyonian Lake near the prehistoric site of Lerna, Dionysus, guided by Prosymnus or Polymnus, descended to Tartarus to free his once-mortal mother. Annual rites took place there in classical times; Pausanias refuses to describe them. "For some say, at Dracanum; and some, on windy Icarus; and some, in Naxos, O Heaven-born, Insewn; and others by the deep-eddying river Alpheus that pregnant Semele bare you to Zeus the thunder-lover. And others yet, lord, say you were born in Thebes; but all these lie. The Father of men and gods gave you birth remote from men and secretly from white-armed Hera. There is a certain Nysa, a mountain most high and richly grown with woods, far off in Phoenice, near the streams of Aegyptus..."
Semele was worshipped at Athens at the Lenaia, when a yearling bull, emblematic of Dionysus, was sacrificed to her. One-ninth was burnt on the altar in the Hellenic way; the rest was torn and eaten raw by the votaries. Semele was a tragedy by Aeschylus; it has been lost, save a few lines quoted by other writers, and a papyrus fragment from Oxyrhynchus, P. Oxy. 2164. Semele is attested with the Etruscan name form Semla, depicted on the back of a bronze mirror from the fourth century BCE. Incited the Latian Bacchae with deceiving words:"
Augustine notes that the goddess is named after stimulae, "goads, whips," by means of which a person is driven to excessive actions. The goddess's grove was the site of the Dionysian scandal that led to official attempts to suppress the cult. The Romans viewed the Bacchanals with suspicion, based on reports of ecstatic behaviors contrary to Roman social norms and the secrecy of initiatory rite. In 186 BCE, the Roman senate took severe actions to limit the cult, without banning it. 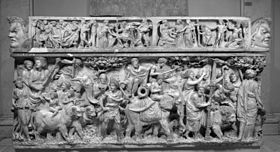 Religious beliefs and myths associated with Dionysus were successfully adapted and remained pervasive in Roman culture, as evidenced for instance by the Dionysian scenes of Roman wall painting and on sarcophagi from the 1st to the 4th centuries CE. The Greek cult of Dionysus had flourished among the Etruscans in the archaic period, and had been made compatible with Etruscan religious beliefs. One of the main principles of the Dionysian mysteries that spread to Latium and Rome was the concept of rebirth, to which the complex myths surrounding the god's own birth were central. Birth and childhood deities were important to Roman religion; Ovid identifies Semele's sister Ino as the nurturing goddess Mater Matuta. This goddess had a major cult center at Satricum that was built 500–490 BCE. The female consort who appears with Bacchus in the acroterial statues there may be either Semele or Ariadne. The pair were part of the Aventine Triad in Rome as Liber and Libera, along with Ceres. The temple of the triad is located near the Grove of Stimula, and the grove and its shrine (sacrarium) were located outside Rome's sacred boundary (pomerium), perhaps as the "dark side" of the Aventine Triad. In the later mythological tradition of the Christian era, ancient deities and their narratives were often interpreted allegorically. In the Neoplatonic philosophy of Henry More (1614–1687), for instance, Semele was thought to embody "intellectual imagination", and was construed as the opposite of Arachne, "sense perception". In the 18th century, the story of Semele formed the basis for three operas of the same name, the first by John Eccles (1707, to a libretto by William Congreve), another by Marin Marais (1709), and a third by George Frideric Handel (1742). Handel's work, based on Congreve's libretto but with additions, while an opera to its marrow, was originally given as an oratorio so that it could be performed in a Lenten concert series; it premiered on February 10, 1744. Victorian poet Constance Naden wrote a sonnet in the voice of Semele, first published in her 1881 collection Songs and Sonnets of Springtime. ^ Although Dionysus is called the son of Zeus (see The cult of Dionysus : legends and practice Archived 2007-10-11 at the Wayback Machine, Dionysus, Greek god of wine & festivity, The Olympian Gods Archived 2007-10-02 at the Wayback Machine, Dictionary of Greek and Roman Biography and Mythology, The Columbia Encyclopedia, Sixth Edition, 2007, etc. ), Barbara Walker, in The Woman's Encyclopedia of Myths and Secrets, (Harper/Collins, 1983) calls Semele the "Virgin Mother of Dionysus", a term that contradicts the picture given in the ancient sources: Hesiod calls him "Dionysus whom Cadmus' daughter Semele bare of union with Zeus", Euripides Archived 2008-07-24 at the Wayback Machine calls him son of Zeus, Ovid tells how his mother Semele, rather than Hera, was "to Jove's embrace preferred", Apollodorus says that "Zeus loved Semele and bedded with her". ^ Julius Pokorny.Indogermanisches Etymologisches Woerterbuch: root *dgem.Compare Damia:"Demeter" (mother earth). ^ Compare Žemyna (derived from žemė – earth), the goddess of the earth (mother goddess) in Lithuanian mythology, and Zeme, also referred to as Zemes-mãte,a Slavic and Latvian goddess of the earth :Ann, Martha and Myers Imel, Dorothy. 1993. Goddesses in World Mythology. Santa Barbara. CA: ABC-CLIO. ^ Or in the guise of Semele's nurse, Beroë, in Ovid's Metamorphoses III.256ff and Hyginus, Fabulae167. ^ Apollodorus, Library 3.4.3; Apollonius Rhodius, Argonautica 4.1137; Lucian, Dialogues of the Gods 9; compare the birth of Asclepius, taken from Coronis on her funeral pyre (noted by L. Preller, Theogonie und Goetter, vol I of Griechische Mythologie 1894:661). ^ Semele was "made into a woman by the Thebans and called the daughter of Kadmos, though her original character as an earth-goddess is transparently evident" according to William Keith Chambers Guthrie, Orpheus and Greek Religion, rev. ed. 1953:56. Robert Graves is characteristically speculative: the story "seems to record the summary action taken by Hellenes of Boeotia in ending the tradition of royal sacrifice: Olympian Zeus asserts his power, takes the doomed king under his own protection, and destroys the goddess with her own thunderbolt." (Graves 1960:§14.5). The connection Semele=Selene is often noted, nevertheless. ^ Timothy Gantz, "Divine Guilt in Aischylos" The Classical Quarterly New Series, 31.1 (1981:18-32) p 25f. ^ CIL 6.9897; R. Joy Littlewood, A Commentary on Ovid's Fasti, Book 6 (Oxford University Press, 2006), p. 159. ^ W.H. Roscher, Ausführliches Lexikon der griechischen und römischen Mythologie (Leipzig: Teubner, 1890–94), vol. 2, pt. 1, pp. 226–227. ^ Described by Livy, Ab Urbe Condita 39.12. ^ Littlewood, A Commentary on Ovid, p. xliv. See particularly the paintings of the Villa of the Mysteries. ^ Littlewood, A Commentary on Ovid, p. xliv. ^ Michael Lipka, Roman Gods: A Conceptual Approach (Brill, 2009), pp. 18–19. ^ Henry Moore, A Platonick Song of the Soul (1647), as discussed by Alexander Jacob, "The Neoplatonic Conception of Nature," in The Uses of Antiquity: The Scientific Revolution and the Classical Tradition (Kluwer, 1991), pp. 103–104. ^ Dean, Winton (1959). Handel's dramatic oratorios and masques. London: Oxford University Press. p. 365. ISBN 0-19-315203-7. ^ Naden, Constance (1894). The Complete Poetical Works of Constance Naden. London: Bickers & Son. p. 137. Kerenyi, Carl, 1951. The Gods of the Greeks pp. 256ff. Seltman, Charles, 1956. The Twelve Olympians and their Guests. Shenval Press Ltd.
Wikimedia Commons has media related to Semele. Chisholm, Hugh, ed. (1911). "Semelē" . Encyclopædia Britannica. 24 (11th ed.). Cambridge University Press. p. 616.